You were indeed fortunate, Agricola, not only in the distinction of your life, but also in the lucky timing of your death. Who the first inhabitants of Britain were, whether natives or immigrants, remains obscure; one must remember we are dealing with barbarians. Benefits received are a delight to us as long as we think we can requite them; when that possibility is far exceeded, they are repaid with hatred instead of gratitude. Think, therefore, as you advance to battle, at once of your ancestors and your posterity. It is part of human nature to hate the man you have hurt. More faults are often committed while we are trying to oblige than while we are giving offense. There was more courage in bearing trouble than in escaping from it; the brave and the energetic cling to hope, even in spite of fortune; the cowardly and the indolent are hurried by their fears,' said Plotius Firmus, Roman Praetorian Guard. Under Domitian not the smallest part of one's misery was to see and be seen. Great eloquence, like fire, grows with its material; it becomes fiercer with movement, and brighter as it burns. Lust of absolute power is more burning than all the passions. 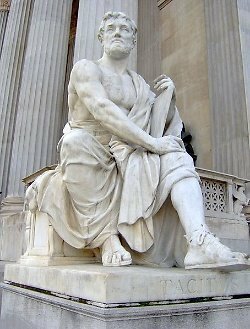 Bio: Publius Cornelius Tacitus was a senator and a historian of the Roman Empire.